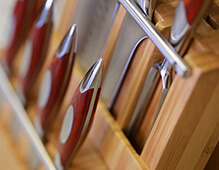 If you have seen us at any shows recently, you may have come across us showing off our new knife range. After consulting with more than 100 professional chef’s worldwide, our design team has created the most balanced, ergonomic and beautiful knife ever seen, well we’re inclined to think so anyway. So without further ado, we are proud to introduce our newest line of premium cutlery, Rhineland.